A winner is declared in the War Bond contest to become Lum's bride! And that's not all. The community is exposed to surrealist painting, Mousey returns from the war, and a runaway girl seeks protection in the Jot 'Em Down Store. 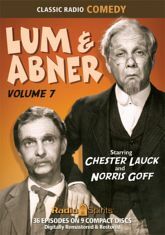 Come hear Chester Lauck and Norris Goff as they star in 36 consecutive episodes from the summer of 1943.